Thanksgiving is a time of praise and plenty. Surrounded by friends and family, we celebrate the fruits of the past year. But what did this feast mean to the first inhabitants of America? The Pilgrim Fathers landed at Cape Cod on 21st November 1620. 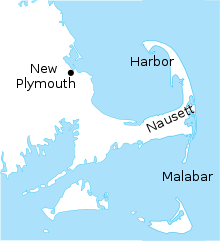 They came ashore at Provincetown, just inside the tip of the rocky headland. It was not a good place to found a colony: a few days later they moved the boat to New Plymouth, Massachusets. The winter weather in this new world was worse than their wildest dreams. They crowded back aboard the boat and lived there for the next three months. These early settlers were English folk. They were not Puritans; the Founding Mothers (of whom we hear less) wore colourful dresses with full skirts. They were not Quakers, so-named several decades later. They were Protestant Dissenters, leaving their homeland for the freedom to worship God in their own way. The passenger lists of the Mayflower give 102 names: a mixture of men, women and children (including several fosterlings of illegitimate birth). The Mayflower was a merchant ship, square-rigged with three masts, about 100ft long and 25ft wide, sailed by about 28 crew. The quarters were cramped enough during the nine-week voyage; almost unbearable in the three months that followed. The people were weakened by hunger and disease. Half of those on board died during that first terrible winter. They would all have perished were it not for the generosity of the Native Americans. A Wampanoag leader named Massasoit gave them food when their own supplies ran out. Tradition says that at one point, they were surviving on five grains of corn a day. The following spring, a man called Squanto showed them how to plant the ‘Three Sisters’ – the staple local crops of maize (sweetcorn), beans (legumes) and squash (marrows and pumpkin). He taught them to fertilize the corn with a fish-head under every shoot. That autumn, the settlers brought in an adequate harvest. They knew now that they could survive in this new land. The First Thanksgiving was a feast to thank God and the Indians. 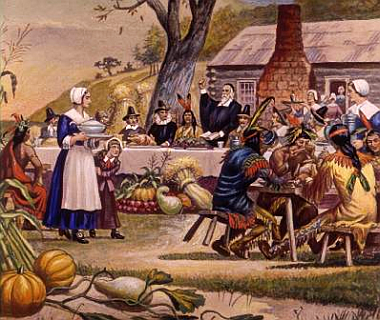 Actually, New England colonists regularly held thanksgivings, but these were more usually days of prayer and fasting. The Christian Eucharist of consecrated bread and wine is literally a thanks-offering (Greek eucharistos, grateful). Thankfully for us, prayer and fasting was not the Native way. Ninety Indians arrived with turkeys for a three-day festival, expecting song and dance. The Thursday start gave the Pilgrims time to enjoy themselves before the Sabbath observance. Thanksgiving was declared a national holiday by President Abraham Lincoln in 1863 during the Civil War. It was originally celebrated on the last Thursday in November; this was moved to the fourth Thursday in 1941 to extend the Christmas shopping season. It is now the biggest holiday in the most powerful country in the world. 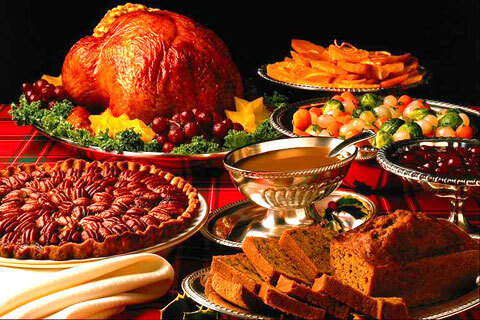 The festive meal includes maize, beans, turkey, cranberry sauce and of course pumpkin pie. Five grains of parched corn on every plate remind us of the hardship of those early days. Happy Thanksgiving! More stories in ‘LifeWorks‘ by Jane Bailey Bain. Visit my Author Page and follow me on Twitter @janebaileybain. If you like this post, use the buttons below to Share on Stumbleupon, Facebook or Twitter. This entry was posted in History, LifeWorks and tagged Communion, Eucharist, First Thanksgiving, Jane Bailey Bain, LifeWorks, Maize, Massasoit, Mayflower, Pilgrim Fathers, Squanto, Thanksgiving, Thanksgiving traditions, Wampanoag. Bookmark the permalink. I wonder how the idea took root that the pilgrims were Puritans. Just propaganda, I suppose. It warms my heart to know that was not the case. It takes some of the grim out of the scene. And the image of the natives arriving, food in hand and primed for a party, is irresistible. The Puritans settled at nearby Boston in 1628, so the confusion is not surprising!